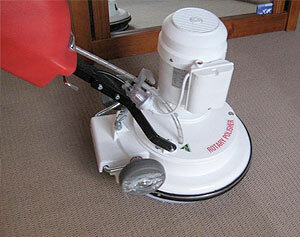 The dry carpet cleaning method is becoming a popular choice for carpet cleaners on the Gold Coast. However, at Get Fresh Carpet Cleaning we only recommend this to be used on carpets that are lightly soiled. You would typically use this carpet cleaning service in properties with reasonably new carpets or carpets that haven’t been exposed to heavy foot traffic soils and stains. It is also a great choice for resorts, hotels, medical centers, schools and temporary accommodation where regular carpet care has been implemented. We have used this method regularly in some of the Gold Coast Resorts because the drying times are quick and convenient when guests are arriving on the same day. Dry cleaning would not be adequate in circumstances where the carpets are heavily soiled or stained. Such places would be the likes of nightclubs, restaurants, bars and factory offices where there is a huge amount of foot traffic, food, drinks and grease etc. You should also be aware of carpets in hallways where excessive ingress of dirt, sand, skin and soils have caused heavy marks and grey areas. For these heavily soiled carpets we highly recommend that you use our carpet steam cleaning method, it gives a much deeper clean with hot water extraction. So now you should have an idea if this is the right choice for your carpets or not, but just what is dry carpet cleaning? Well it isn’t entirely a dry process, it is light moisture (approx 90% less than steam cleaning) and has a much faster drying time than steam cleaning, approx 60 minutes until fully dry. I’ll go more into the procedure below but in a nut shell what happens is that our process breaks down soils and dirt, this dirt becomes encapsulated and turns into small microscopic crystals. These crystals dry and just sit waiting to be removed on its next vacuum (after 24 hrs). That’s basically it! The disadvantage with dry carpet cleaning is that it only cleans the top 3rd of the fibers and therefore no matter how good your carpet looks on the surface, it will remain dirty at the bottom. For this reason we suggest not to rely only on dry cleaning every time you decide to have your carpets cleaned. Leading carpet cleaning products manufacturers recommend that your carpet cleaning plan should consist of a maximum of 2 carpet dry cleans then 1 steam clean for lightly soiled carpets and alternate between 1 dry and 1 steam for medium soils. For extremely dirty carpets I suggest you go straight for the steam cleaning method. We will inspect those carpets that you want us to dry clean and give you our professional opinion as to whether we think the dry cleaning method will be adequate for the condition of your carpets. If not we will advise the steam clean instead. If the area needs to be vacuumed we will do this before continuing through to the next steps. During this stage we also visually assess any stains and ask that you make us aware of problem areas that may cause you concern. If we identify any stubborn carpet stains we will pre treat them at this stage. Now the magic starts to happen as we prespray your carpets with our biodegradable prespray shampoo that breaks down the soils and encapsulates the molecules in what I can only describe as little crystallized sacks. This crucial stage is the one where we operate our rotary dry cleaning machine in multiple directions. The bonnet pad sits under the machine and gently agitates the carpet and prespray solution and simultaneously absorbs moisture as it rotates. You will notice a brighter appearance in your carpet fibres as the machine glides gently back and forth. We will conduct a final inspection to see if any previously identified stains have been removed. If not then the application of more advanced stain removers will be used, this will generally be more than adequate. Any carpet stains that still remain may have become permanent, at this stage we could discuss specialist techniques with you but this is a separate service and would incur additional costs to the customer. After encapsulation for optimum results it is suggested that the carpets shouldn’t be vacuumed for a further 24 hours. This of course is the responsibility of the customer. The final vacuum works by lifting all of the remaining encapsulated soils from the carpet fibres, this can wait until the next scheduled vacuum if you prefer because once it’s crystalized it remains that way until removed. Times have changed in the carpet cleaning industry! The innovative encapsulation shampoos that we have moved towards produce much better results than our traditional counterparts. Old methods would leave residue in your carpet fibres, some carpet cleaning services still refuse to move with the times and stick to traditional methods for some reason resulting in a poor clean. We are proud to say that here at Get Fresh Carpet Cleaning Gold Coast we are 100% focused on Pride and Quality, we continually communicate with our distributors to make sure we are using the best products to give our customers the best dry carpet cleaning results. Dry Carpet Cleaning – Video Demonstration!